In June Minister of Finance (and Prime Minister) Robert Muldoon announced a simultaneous freeze on wages and prices, the most dramatic peacetime economic regulation in New Zealand history. This blunt weapon was aimed at rising inflation, but many economists believed this would merely be suppressed. Unsurprisingly, the freeze was unpopular with both employers and workers. Its original 12-month period was extended and the freeze stayed in place until late 1984. In 1982 football stepped out of the shadow of rugby when the national side – known as the All Whites – took on the best in the world at the World Cup finals in Spain. New Zealand had battled through an epic qualifying schedule of 15 games over nine months at venues stretching halfway around the globe. Success came at last on 10 January, when China was defeated 2-1 in a playoff in Singapore despite stifling humidity and a 60,000-strong pro-China crowd. In Spain the team performed with credit but lost its three pool matches against Scotland, the Soviet Union and perennial World Cup favourites Brazil. For many, the All Whites had won their world cup by qualifying. In November a blizzard forced experienced climbers Mark Inglis and Philip Doole to take shelter in a crevasse near the summit of New Zealand’s highest peak, Aoraki/Mt Cook. They endured 13 days and nights in terrible weather conditions while the nation waited anxiously. By the time they were rescued both men had suffered such severe frostbite that their legs had to be amputated below the knee. 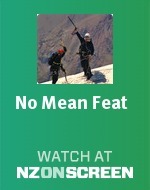 Undeterred, both retained their passion for climbing. In 2006 Inglis became the first double amputee to reach the summit of Mt Everest – at the cost of a few fingers and more of his legs. Inglis also won a silver medal in the cycling time trial at the 2000 Sydney Paralympic Games. The Official Information Act became law, enabling people to request and receive information held by government officials and bodies. The maverick former left-wing politician John A. Lee died. The Privy Council ruled that Western Samoans born since 1924 were entitled to New Zealand citizenship. Concerned about increased immigration, the government challenged the ruling and was accused of breach of faith and racism. The first kōhanga reo kindergarten opened in Wainuiomata. The controversial Clyde high dam project got the green light after an initial grant of water rights was overturned by the High Court following an appeal by landowners. The first Warehouse store opened in Takapuna, Auckland. On 18 November ‘punk rock’ anarchist Neil Roberts blew himself up in an unsuccessful attack on the Whanganui computer centre which housed the government’s first centralised electronic database. The Māori-language news programme, Te karere, screened for the first time. At the Music Awards, Prince Tui Teka was awarded Single of the Year for ‘E Ipo’. Dave Dobbyn was voted Top Male Vocalist and his band, DD Smash, was chosen as Group of the Year. Having given the country a new catchphrase with ‘Jeez, Wayne’ and lampooned Prime Minister ‘Piggy’ Muldoon, David McPhail and Jon Gadsby were voted the country’s Best Television Entertainers. ‘Queen of Crime’ Ngaio Marsh died just weeks after submitting her 32nd Inspector Alleyn detective novel, Light thickens, to her publishers. Do you remember 1982? Add your memories and comments in the form below. We have 2 events in history, 3 articles, 1 comment related to The 1980s.